Pocket Shot Circular Slingshot - Black | BUDK.com - Knives & Swords At The Lowest Prices! Truly the future of slingshot evolution, Pocket Shot is the ancient projectile weapon, reinvented and re-engineered to the pinnacle of its performance potential. Pocket Shot's patented circular design allows users to load and shoot a variety of projectiles at two to three times the rate of traditional slingshots. And with a shooting velocity of up to 350 fps, it's a serious weapon with serious real world applications. 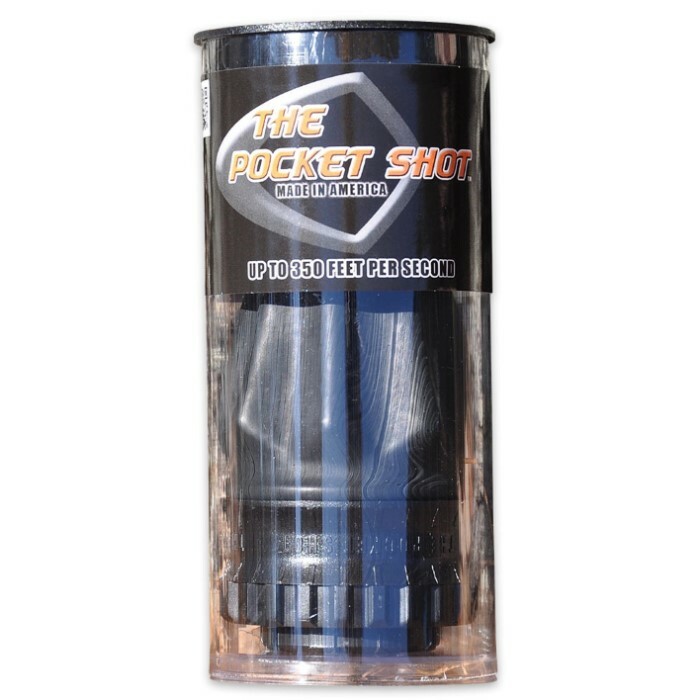 The Pocket Shot's compact, discreet form makes it perfect for outdoorsmen with limited gear space. At just 2 3/10" in diameter, 5" long when open and a minuscule 1 3/10" long closed, it fits easily in a tackle box, backpack, waist pouch, and of course - as the name implies - in a pocket. Use it to hunt small game or to ward off dangerous animals; it's also fun for target practice and casual shooting in the backyard (away from neighbors' property of course). 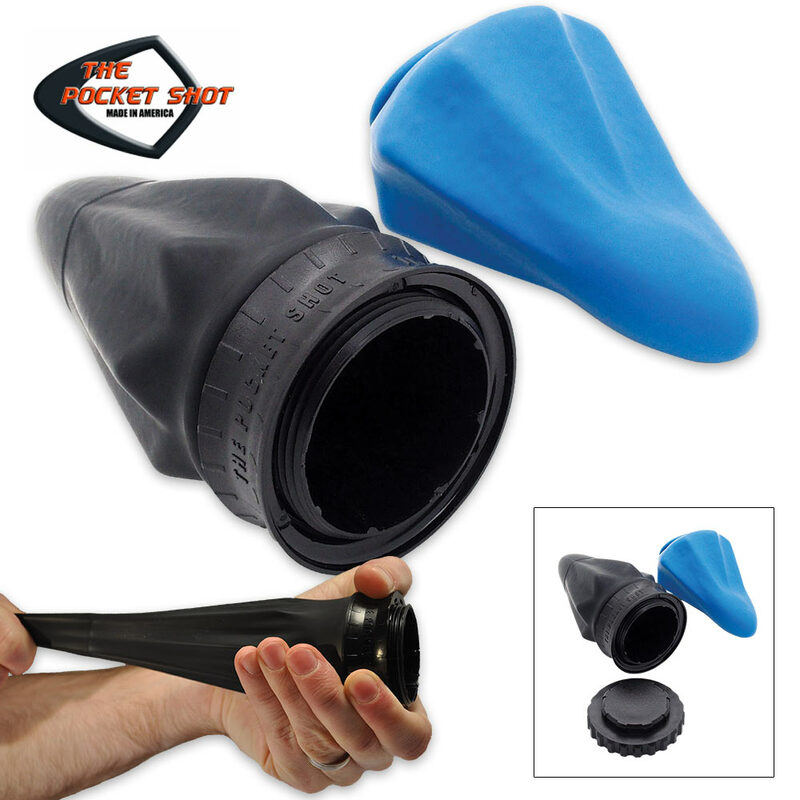 Just load the conical latex pouch with shot of your choice, stretch it back, aim and release! It couldn't be simpler! The makers of Pocket Shot recommend 1/4" to 5/16" steel slugs, marbles, small paintballs (around .4 cal) and airsoft pellets as projectiles. They warn against using BBs, as they may tear the pouch and can be excessively dangerous. Pocket Shot also offers its own line of slingshot projectile ammo in various sizes (sold separately). Proudly made in the USA, every step in Pocket Shot's manufacturing process has been engineered to maximize power, accuracy and durability in every slingshot. To make the springy pouches, advanced, patented aluminum molds are dipped in the highest quality latex and hand rolled to perfection. The base ring, locking ring and protective cap are all made from a tough fiber reinforced composite - the same used in many top of the line knife and gun handles - and CNC-cut to ensure every unit is identical. The Pocket Shot is a far cry from a rubber band tied to a "Y" shaped twig, and it even outperforms many wrist-supported tactical slingshots. All this, yet it fits in your pocket! You simply couldn't ask for more from a slingshot!